This post is for general information only, and should not be relied upon as investment advice. Calzada has been reviewed before. The purpose of this post is to highlight positive announcements to the market in the past month. Polynovo Biomaterials which uses a biodegradable polymer platform as a surgical dressing, and as a scaffold for tissue regeneration. Metabolic Pharmaceuticals which has a $50 million investment in the compound AOD9604 with the ability to promote the healing of skeletal and soft-tissue injuries. 15 July 2014 – Respected Chairman of Calzada David Williams announced that Laurent Fossaert would be leaving the company, which is looking to recruit a new Managing Director. Until then the position will be jointly held by experienced Director David McQuillan, and Investment Banker and Chartered Accountant Philip Powell. 21 July 2014 – PolyNovo Biomaterials has obtained CE (Conformite Europeenne) Mark certification for its Topical Negative Pressure foam wound dressing known as NovoPore. It also holds ISO 13485 accreditation for the Company’s Quality Management System a step required before it can manufacture medical devices. This dressing is specifically helpful in the treatment of chronic exudative ulcers such as ‘bed-sores’. This product has now met the regulatory requirements to be marketed in Europe and in Canada and so will need to expand its manufacturing capability and to recruit additional staff. The global market is estimated at US$2.5 billion. 31 July 2014 – Metabolic Pharmaceuticals announced that it had received full Generally Recognised As Safe (GRAS) status in the USA enabling it to market AOD 9604 as a nutrient supplement up to a level of 1mg per person. Metabolic already has non-exclusive licenses with two Australian compounding pharmacies to use AOD 9604 in compounded medicine preparations that comply with Australian regulatory requirements. Revenue from these licenses is small at present. Metabolic is examining ways to best extract value from AOD 9604, and will consider options such as licence, trade sale, and separate listing. In just one month from mid-February 2014, the share-price jumped from 7.5 cents to a high of 16 cents before easing back to trade in a range between 9.5 and 12.5 cents. The trading range takes the form of rising band, or flag. The rising upper and lower borders suggest that there will be a break-out to the upside, but this cannot be taken for granted. 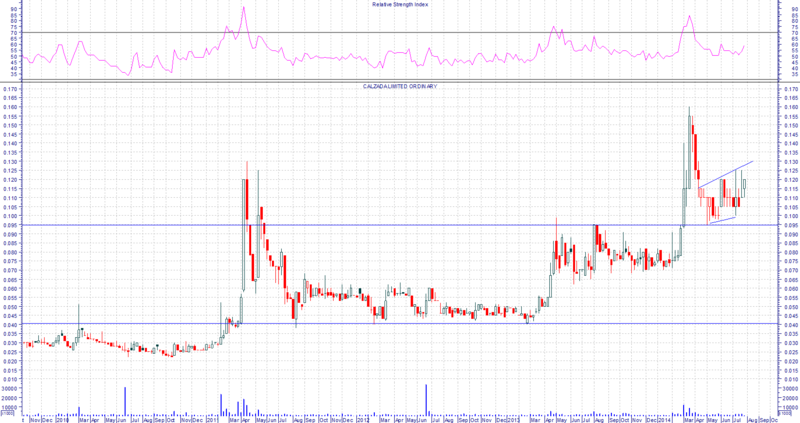 It is likely that if breakout is to the upside that the previous high at 16 cents will be tested. Breakout to the downside may well find support as it has in the past at about 7 cents. If this level fails to hold the next support is at 4 cents. Traders wishing to go long could look for an entry signal at 13 cents, with a stop-loss position at 9.5 cents. A trading target could be set for 16 – 16.5 cents.